Wondering how to apply your vinyl decal? It’s easy! Dry Method: Clean the surface (wall, wood, glass, window, etc.) and let it dry. The surface needs to be smooth and dust-free. Do not apply to freshly painted walls! Wait for about two weeks for newly painted walls to cure. The vinyl decal is made up of 3 layers – the clear/tissue transfer tape, the actual vinyl decal, and the white grid backing paper. The vinyl decal may have pulled away from the transfer tape – just take a squeegee/credit card/ruler and use the edge to rub firmly across the entire image, starting from the centre and working your way to the edges (transfer tape up). Try to work out any bubbles you might see by pressing them towards the edge. Slowly peel away the transfer tape making sure the vinyl is coming away with the transfer tape. If it starts to separate, help it stay together by pressing the vinyl decal back onto the transfer tape. After the backing paper is removed, slowly roll the decal and transfer tape onto the destination surface. Slowly work out any air bubbles with a squeegee/credit card/ruler. Rub the entire image, applying pressure to adhere the vinyl to the surface. Gently peel away the transfer tape starting from one corner. 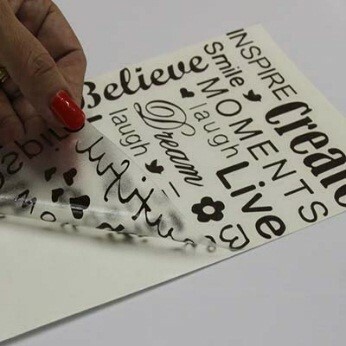 If vinyl decal sticks to the transfer tape, help it to stick to the destination surface with your finger. Be patient and go slow otherwise your decal can stretch. Once the transfer tape is removed, place the backing paper upside down over the vinyl (shiny side down) and rub over with the squeegee/credit card/ruler. 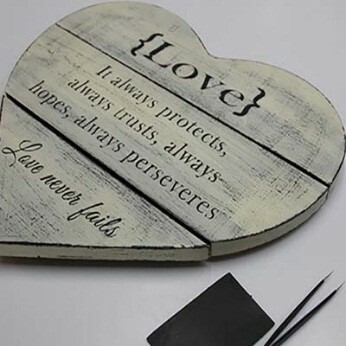 Vintage Peel Off Method: Paint the base colour whatever colour you want the words/pictures to be. Once your base colour is dry, apply the vinyl (see the above instructions). Paint/rub on a decent coat of floor polish over your vinyl (Vaseline and candle wax also works). This is to create a barrier between your 2 colours. Paint your second choice of colour. Here you will need to do at least 2 coats. The first coat must be thinly and evenly applied so it dries quickly. As soon as the first coat is dry, paint a more generous 2nd coat. Before the second coat dries, you must peel off the vinyl using a craft knife or sharp tweezers. Once dry, sand lightly with an 80 grit sand paper to achieve the desired “vintage” effect. Remember to sand in both vertical and horizontal directions so as to appear naturally weathered.